On May 18, 2016, Team Edeline travelled to Institut Edeline in haiti to conduct the first ever Medical physicals on all the students. 135 physicals in all were completed, with plenty of items to follow up with, but for the most part the children were fairly healthy. Now their medical charts have been started and we will continue to conduct annual physicals and record their physical growth and progress. Our volunteer physician had the nicest compliment saying, "the students at Institut Edeline all appeared loved and cared for; the rest is easy." Thank you to all of our volunteers who helped out. On May 15, 2016, The Fitzgerald and Wendfeldt families hosted our 5th annual fundraiser for Institut Edeline. Sixty guests attended and showed great support for our school, helping us attain our goal of achieving $25,000 from our "Matching contribution campaign." Many children were present, with a few of them outstanding performers: Tommy Regan, Kennady Tracy and Catherine Fitzgerald. Silent auction items included a beautiful Longboard surfboard, shaped by Miles Morris and a custom made electric guitar by AJ Debellis, among other valuable items. Seventeen students and two teachers from Institut Edeline are now newly sponsored thanks to the Fitzgeralds and Wendfeldt families. We are in the midst of a very exciting matching campaign. The big fundraiser is occurring this weekend but leading up to it we are spreading the word about our exciting goal, asking for your help in getting there. We have a few donors who are willing to match the amount we can raise! We have set the goal to raise $25,000... meaning we would end up with $50,000 to contribute to our kids in Haiti! Thank you so very much to our contributors and to those who are willing to help us spread the word. Thanks to you we are able to keep our school standing strong. We are able to educate and care for these children who otherwise would likely not have another opportunity. · Each year more people donate to nonprofits. In 2014 the total amount people gave to charities and nonprofit organizations was about $358 billion. · A nonprofit is a public organization so a single person does not own it. Haiti is known for their coffee, cocoa, coconuts, avocados, plantains, oranges, limes, mangos, corns, rice, beans, and bananas. One of the popular and traditional dishes of Haiti is Bannann Peze, otherwise known as fried green plantains. Plantains are very common to eat during any lunch, dinner, or snack. It can be served as a side meal or even as an appetizer. 8. After excess oil is drained serve hot and fresh! Jamesley Cine is one of our students at Institut Edeline in Haiti. 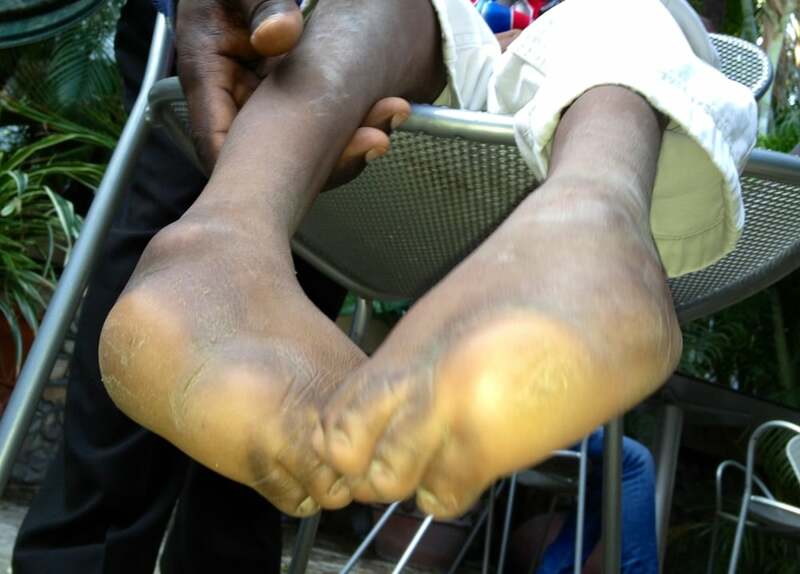 He was born with club feet, a deformity preventing normal ambulation. He would get around on his knees or was piggybacked by his parents and relatives. He recently underwent a surgery just a few months ago by Dr. Paul Munk, Pediatrician located in Toronto, ON. The surgery was very intense, cutting his achilles tendons to release the tightness, preventing his ankle from bending. It was successful and Jamesley is now able to walk. He remains in the US at this time until all therapy is finished, then return to Haiti and Institut Edeline. The doctors say that he will be able to run and play with the other children, which is something he only dreamt of. A special thank you to Aunt Ann, Edeline's aunt for being by his side here in the US during his experience. WTOL 11 reported about Jamesley's story. Please enjoy the video by clicking on the link below. Thank You Team Edeline for all your support in Haiti. Today marks an important day at Institute Edeline as they celebrate the graduation of the 2nd Kindergarten class at our school. This is a big deal in Haiti as many of the children who are fortunate enough to attend school will only see this level graduation. Parents take the day off work and attend this 3 hour ceremony and of course a celebratory meal! Thank you for all your support and help! Last week the Bishop's varsity volleyball teams hosted a fundraiser for Project Edeline! During the match there was a bake sale, music from DJ Felix Mayorga (Alex '20), a backpack collection, an exciting volleyball match and a welcome from Stephanie and Edeline. Volleyball coach Jackie Bernardin says, "What amazing support we had for a great cause! Thank you to the families who brought baked goods, backpacks and made donations; to Felix for DJing; to Gretchen Cash '15 for organizing; and to the players for gathering pledges and playing. And thank you to Byron, Stephanie and Edeline for coming! We are proud to help provide health care, nourishment and educational opportunities to a community in need." Team Edeline Visits Our School in Haiti! Last week we had 4 eager Team Edeline members make their way out to Haiti! They were welcomed with open arms and many, many beautiful smiles. While in Haiti Team Edeline conducted dental health workshops for the kids. Thankfully, prior to the visit they received hundreds of generously donated dental supplies to distribute to the children. These workshops offered an introduction to a new dental hygiene lifestyle for many of the kids. A BIG thank you to those who generously donated supplies! The local San Diego Girls Impact soccer team donated soccer cleats, balls, jerseys and more to give kids at Institute Edeline a chance to play and enjoy the sport they love. It is so awesome to see youth get involved, let us know if you have any ideas for new ways for young people to be apart of Team Edeline! Project Edeline is Having a Benefit Concert! Come out and join us on Friday, April third to enjoy the musical stylings of Kasondra Kazanjian and Branden James! Yesterday a cousin, Saurel Olrich, of Edeline arrived in late afternoon from Miami to help us celebrate her birthday. They had not seen each other in several years as Saurel is a pro soccer player and former Haitian national team player. He is famous in Haiti for scoring the historic goal that allowed Haiti to beat Italy---a world power---a few years ago. He's on his way to play on a club team in Ethiopia and will spend a few days with us. He's an exceptional guy who speaks four languages and has played on club teams in Asia. We hope that one day he will be able to help our kids at school learn to play soccer---he is very interested in that idea. He has a fascinating story, growing up very poor in Cap Haitian, he started playing by himself by kicking spoiled grapefruits that had dropped from the tree. I think you'll see how happy his appearance made the birthday girl. The kids got to open their new gifts this holiday season! We all had so much fun! Edeline is a guest instructor! Last week, Edeline spoke to the high-level French students at La Jolla Country Day. She was quite captivating, as usual, recounting her history and even singing a few songs in French and Creole. Not surprisingly, they want her to return for more. Last month on Sunday October 26th. With so many generous donors and families dedicated to Project Edeline we surpassed our fundraiser goal! The students got together to make some fabulous party hats! Here is a photo of one of our first grade classes! Here they are playing during the break they are so happy to be back school . We are so proud of our little graduates! Graduation ceremonies, especially for kindergartners, are a special occasion in Haiti. Monde, our principal, was able to rent the caps and gowns that were proudly worn by the children. The ceremony included speeches (some by the students), followed by skits and lots of singing. Diplomas were presented to the kids as well. Sadly, 14 children could not participate as they were recently infected with the chikungunya virus which is still ravaging Haiti. Thankfully we have plentiful amounts of medication to treat them and many others, thanks to our friend, Dr. Rich Paat. One of the photos is of Ruth, the teenager who lost her leg in the earthquake, and is now happily living with Edeline's aunt. She enjoyed the event with her new friend, Maudeline. 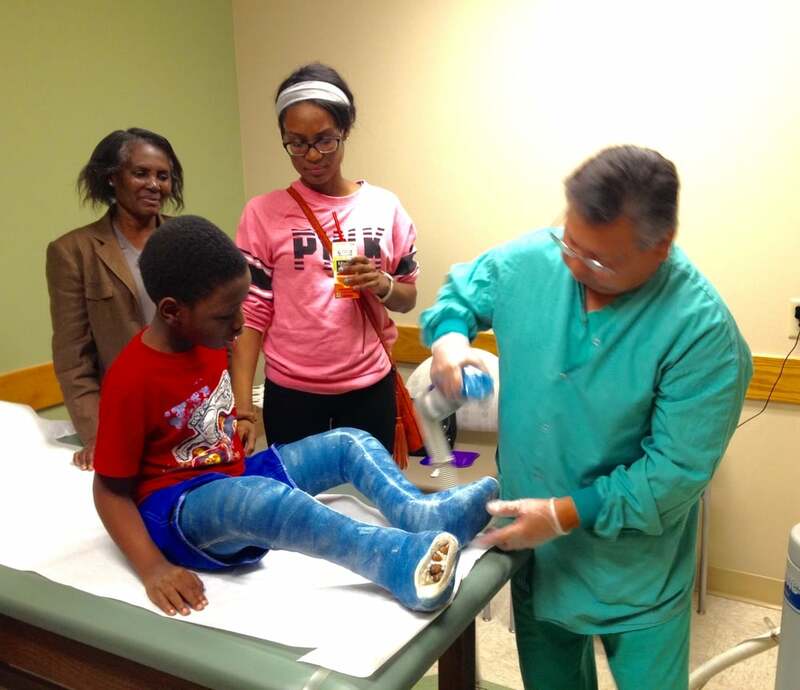 Dr. Chip Munk is our pediatric orthopedic doctor in Toledo that is willing to donate his services to Jamesley Cine! Here are some recent photos! Below is a photo of our wonderful Haitian angel Byron with two orphans, Loveberline and her sister, Beatrice, who lost their mother in the earthquake. Loveberline is the little girl he found in the hospital with broken femurs. The little girls are growing up fast, doing great in school and live with the parents of Pastor Garry's wife.